After the death of Roy Harper's father, Brave Bow, a Navajo Medicine Man, took the boy under his wing, teaching him how to be a master archer. When Brave Bow died, Harper became Green Arrow's ward and sidekick "Speedy," going on many adventures with the Emerald Archer until they had a falling out. Harper joined forces with the Teen Titans, The Outsiders, and the Justice League of America, where he was given the name Red Arrow. That is definitely one of Speedy's origins: that his father was a park ranger who died in a forest fire. That's the story that was presented in Adventure Comics #262, July 1959 (though Brave Bow was originally Sioux, not Navajo). But in February 1955, Adventure Comics #209 told us that Roy's father was a scientist who was killed when one of his inventions exploded, and Roy was raised by "Chief Thunderhead." And in March of 1943, More Fun Comics #89 had revealed Roy and his father were flying over Lost Mesa when their plane crashed, stranding Roy with his father's Indian servant Quoag, who taught him archery in order to survive. So the kid's had three origins over the years, you can pick whichever one you like. This figure is a straight repaint of DCUC7 Green Arrow, which is both good and bad. The good? The Red Arrow costume is supposed to be nothing more than a palette swap of Green Arrow! That's how it was designed. The suit (and the codename) first appeared in Kingdom Come, where Roy Harper had taken over adventuring from the aging Ollie Queen. He's honoring his mentor, but still holding onto his own identity. Nice. The sculpt is just as good in Series 20 as it was in Series 7, with sculpted hems on his shirt and gloves, raised strings stretching across his chest and abs, and tiny wrinkles near the shoulders. His trunks aren't sculpted at all, but the tops of his boots are. One new feature? His belt buckle is an R rather than a G.
So, that's the good. The bad? The fact that this is is the same body as before means he gets the same wrong articulation. GAH! How frustrating. Just to restate it, archery is all about the arms and the back, which means the joints involved are the elbows and the shoulders. Mattel, for some furshlugginer reason, decided to give the mold swivel/hinge wrists. Note: you don't use your wrists to work a bow and arrow. The ideal arrangement would have been swivel wrists and a double-hinged right elbow, but that didn't happen. We confess, you can get him into a decent archery pose with what joints are here, but you won't be using the wrists to do it. In Kingdom Come, Red Arrow had even adopted Ollie's big stupid beard. This figure skips that, because they're not doing the future version, they're doing the (semi-)modern one, from when he joined the JLA. The head is quite nice, capturing Roy's simmering anger - things weren't really going too great for him at the time he wore this costume. Unless we miss our guess, this is another Chris Dahlberg sculpt; if you don't know what that means, read this. 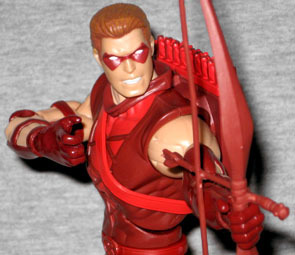 Red Arrow has the same bow as Green Arrow, which means it has the same trick arrow molded as part of it. Of course, GA's accessory got several paint apps, while this one is solid red, but that's not the only corner that had to be cut. Ollie had four trick arrows, but Roy only gets three. They're not identified on the packaging anywhere, but we can guess what they might be: the one with the disc near the tip is a sonic arrow, the one with an arrowhead and a bulb beneath that is a knockout gas arrow, and the one with the long braided section is a net arrow. Or maybe they're all something different, play however you want. Sadly, all the arrows are comically short. An arrow used by a full-grown adult would be somewhere around two-and-a-half, three feet; so in a 1:12 scale, 2½" to 3". Every arrow included with this toy has a shaft only about 1¼": long, meaning they're all half the size they should be. He'd never be able to draw all the way back to his anchor point. So if Red Arrow, like his mentor, uses a bow with a 125 pound draw, and you lose 2 pounds of power for every inch a bow is drawn short, shooting like this would waste a third of his power. Or he'd draw all the way back and shoot himself in the hand. Come on, Horsemen, do better. 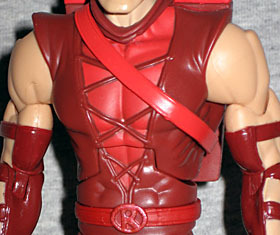 Red Arrow comes with a piece of the Series 20 build-a-figure, Nekron - probably another reason they had to skimp on the accessories. He gets the left arm, which has a real metal chain attached to the wristband, a dry, cracked texture on the skin and... a double-hinged elbow?! Really? After all this time, now they start modernizing the articulation? With a mold that will never be used again? Mattel, we will never understand you. We kind of stopped doing our "Mattel schools DC Direct" feature a while ago, or at least stopped paying attention to it. It's a shame, though, because as much as we complained about the bad choices in the articulation and the cold hard fact that the accessories are the wrong size, this is still the best Red Arrow toy there's ever been. DC Direct tried twice, and neither of them even comes close to this one.